Feeling lucky? This month, you can win 1 of 30 pairs of Retro Sunglasses. Don't miss out on this fab freebie - enter now! Retro sunglasses are the ultimate Summer-style staple, and today we're giving you the chance to win a pair absolutely free! 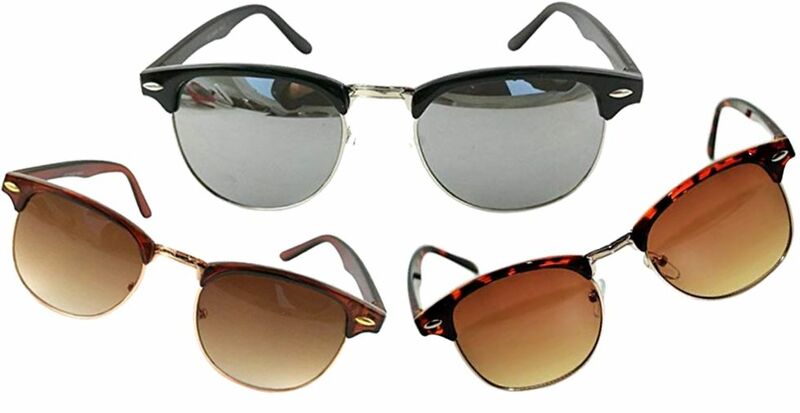 There are three classic colours available - brown, silver mirror and tortoise and gold - in a typical retro style that complements every face shape. The lenses are full UV400, so promise to keep your eyes protected without compromising on style. Could they get any better? Fancy getting your hands on a pair of Retro Sunglasses? Just sign up for our handy household tips newsletter by completing the form below. Winners will be chosen at random. Hey yes I like free. Fingers crossed for you, Vicky-Ann! i would reallyyy like one to as its y 13th birthday on tuesday!!! Happy Birthday for Tuesday from all of us here at Expert Home Tips! I would love a pair as I’m a huge fan of retro sunglasses ???? I would love a pair as im going on holiday soon. And what better way to enjoy the sun with a pair of retro sun glasses. I'm off hols so some retro glasses would be great. Looking forward to your expert home tips. They'd certainly come in handy, Dominique. Thanks for reading our posts! I would love a pair as my boys got a bit of a lazy eye and is really cautious of people staring at him so I'd love to get a pair so he feels better about going out. Hi Davey! Thanks for commenting. If you love free stuff, you'll also love Magic Freebies website! I'm into everything retro, vintage as a fact, being a 70's teenager, I lived it and to this day, love the look. I always incorporate the look rather it be in my style and the way I decorate my home. I would love to win as I have never had a pair of shades before that look so beautiful and classy!! ???? ???? Would come in handy since it’s been so HOT !!! Nice present for me ?? Would love to gift a pair of these fab retro glasses to my daughter in law who is a huge fan of all things retro. new pair of sun glass of the summer would be great. Omg I love retro sunglasses! Would love a pair!!!! Would love to win, have never won anything before. Yes please would be Great to Win ???? They look great. Would definatly come in perfect for my upcoming trip away! i am growing my hair giving myself a makeover so I would love these to glàm up mynew lool!! PLLLEEEAAAASSSEEEE can i have a pair??????? Ive just come out of hospital so i would love to win it would be a lovely surprise and it would cheer me up. The glasses look so classy, ill keep my fingers crossed.